Repairs are underway to the ferry dock in Hingham, Massachusetts, following the storm. The owner of Woody's Goodies, a food truck, relies on that dock. Repairs are underway to the ferry dock in Hingham, Massachusetts, with ice damage halting service for over a week, but while commuters there are frustrated, they are also rallying behind a South Shore business owner who relies on them. James Wood, who everyone refers to as "Woody," has parked his food truck in the same spot in the Hingham shipyard for eight years. Woody's Goodies is known for serving hot coffee and food with a smile before passengers rush on to the Hingham ferry, but when service shuts down to commuters, he loses his customers. It is exactly what happened on Jan. 2, when ice damaged part of the dock. Crews have been out working to fix it, but as of Thursday, service had yet to be restored. "I kind of had a feeling when that cold weather came with the ice in the harbor," Wood said. "When anything like that happens down there and people can't take the boats, I'm out of business." However, Wood's regulars were not out of ideas to help his business. They started a GoFundMe page for the father of two and raised over $4,000 in 24 hours. Donations are still pouring in from his customers even though he never asked for it. "It's unbelievable," Tim Melchione said. "And it says a lot for this community, that they're stepping up and helping him out." Donations have ranged from just a few dollars to an anonymous donor who gave $500. Wood said he had no idea they were setting up the fundraising page and he is speechless. He said he will be buying his customers more than a few rounds of coffee to say thank you once he is back up and running, hopefully by next week. "I can't even tell you how much this means to my family," Wood said. "It just goes to show you the humanity of people helping people around tough times like this. South Shore commuters are probably the best people I've met in my life." 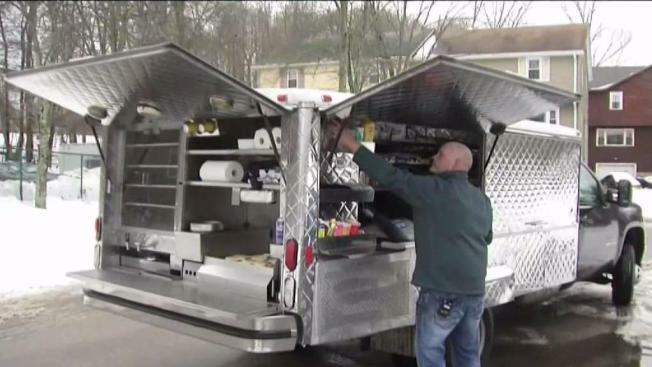 Wood said he plans to pay it forward and contribute to another cause close to his heart, a Randolph resident battling ALS who he was hoping to raise money for with his food truck. With the GoFundMe for Wood almost at its goal, he is asking people to donate here instead.